The aim and commitment of Subproductos Cárnicos Echevarria consist of the continual improvement both in the management of the processing plants processes and in the collection service of raw material. Quality and safety management programmes based on techniques of Hazard Analysis and Critical Control Points (HACCP) and on ISO9001 standard. Environmental management programmes based on ISO14001 standard, preventing, minimising and /or eliminating the impact on environment. Labour Risk Prevention programmes to prevent, minimise and/or eliminate the inherent risks of each workplace both for internal and external personnel. We can ensure an optimal management of the by-product from its collection until the dispatch of final products to customers, keeping always 100% of traceability. The management oriented towards our customers ‘satisfaction. Promotion of training and environmental awareness. Prevention of labour accidents and our employees’ health surveillance. Orientation towards the future with innovation and permanent research. We apply food safety principles as Hazard Analysis and Critical Control Points (HACCP), oriented to eliminate the risks that can affect the safety of our products. 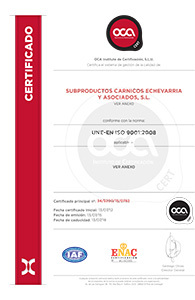 Thanks to this approach and within the framework of Quality Management, we comply with the current legislation. The management programme of Subproductos Carnicos Echevarria leads us not to approach the day-to-day management only to achieve economic goals, but that these ones are compatible with social and environmental aspects, respecting our employees’ values and ethical principles, society and the environment. 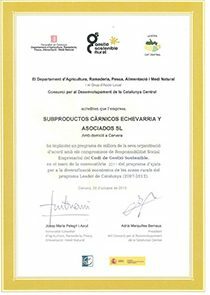 Since 2012 our company has implanted the Corporate Social Responsability (CSR) programme to improve the organisation, thanks to the advice from « Consorci per al Desenvolupament de la Catalunya Central » and according to the commitment of the Corporate Social Responsability of Sustainable Management Code. Subproductos Cárnicos Echevarria has as activity the collection, transportation, processing and valorisation of animal by-products which are not intended for human consumption and the commercialisation of derived products, contributing that way to prevent or minimise adverse impacts on the environment and public health. Building trust and satisfaction to current customers and boosting the future ones commercialising safety and quality products. Complying with current legislation and with commitments voluntarily subscribed about quality, safety and sustainability of products and services, environment protection and work safety. Improving continually the efficiency and effectiveness of the Integral Management system, adjusting the process to the forefront of the sector to fulfil the company goals. Diffusing the Integral Management System policy and working with staff committed to our organisation’s goals, promoting their training and environmental awareness. 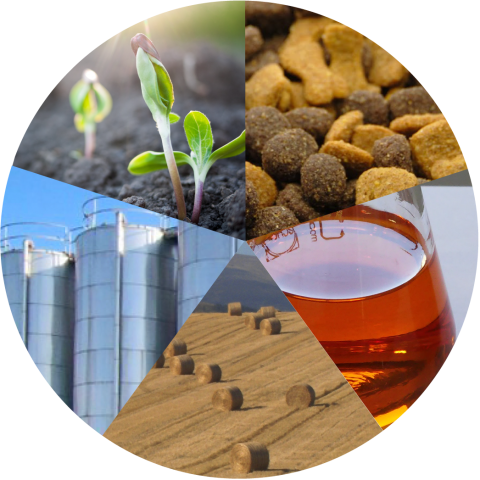 Authorisation number for establishments which process raw materials for category 3 animal feed (SANDACH regulation). It also authorises operators which transport category 3 animal by-products and derived products. Authorisation number for establishments which process category 1 and 2 raw materials (SANDACH regulation). Authorisation number for the transport of category 1 and 2 products (waste management regulation). Subcarn Echevarria is member of la Asociación Nacional de Industrias Transformadas de Grasa y Subproductos Animales (ANAGRASA), Spanish business organisation of animal by-products processing sector coming from the supply chain, food distribution and products of animal origin. 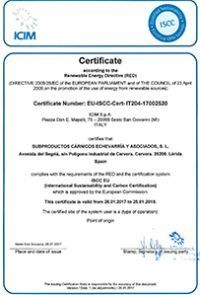 Mr. David Codina Relats, who is the manager of Subcarn Echevarria S.L., is also the president of this organisation. EPRA is the association which represents the European animal by-products processing sector. Its objective is to continually improve the safety, security and sustainability of European food production by the efficient treatment of animal fats and other by-products.